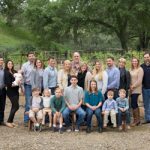 It would be hard to find a family that represents the phrase “family business” better than the Sangiacomos who own and manage Sangiacomo Family Vineyards in Sonoma. As third generation Sonoma County farmers, Steve, Mike and Mia have successfully taken over the family grape growing business from their father Angelo, Aunt Lorraine and Uncle Buck. Their goal? To pass on their love of farming and passion for the wine industry to one or more of their seven children, the fourth generation of Sangiacomos. It would be hard to find a family that represents the phrase “family business” better than the Sangiacomos who own and manage Sangiacomo Family Vineyards in Sonoma. As third generation Sonoma County farmers, Steve, Mike and Mia have successfully taken over the family grape growing business from their father Angelo, Aunt Lorraine and Uncle Buck. Their goal? To pass on their love of farming and passion for the wine industry to one or more of their seven children, the fourth generation of Sangiacomos. The Sangiacomos are passionate about three things above all else: agriculture, viticulture and family. For this reason, the Sonoma County Farm Bureau has chosen to honor them as this year’s Farm Family of the Year. They will be presented the award at the annual Love of the Land event on July 16th along with Paul Martin who will be receiving the Hall of Fame award and Harmony Farm Supply who will be presented with the Luther Burbank Conservation Award. Steve, Mike and Mia’s grandparents, Vittorio and Maria, immigrated from Italy and began farming in Sonoma Valley in 1927. The ranch has since been successfully passed down through two more generations, something of which the family is immensely proud. “Our grandparents left their legacy by passing the ranch onto the next generation and laid a foundation where it’s become our goal to do our part to leave the business in better condition for the next generation,” said Steve. Now, Steve and Mike actively farm more than 1600 acres of vineyards in Sonoma County. While not involved on a day-to-day basis, Mia is still an active partner and her husband, Mike Pucci, is involved with Sangiacomo Vineyards. They sell their grapes locally, with more than 90% of their fruit staying in Sonoma and Napa Counties. The Sangiacomos sell to over 70 wineries, some of whom they’ve been doing business with for more than 20 years including Benziger, LaCrema, Landmark, MacRostie, Rombauer, Saintsbury and Simi. The family has created a successful Sangiacomo brand with more than 40 vineyard designates. “We’re proud to deliver grapes that go into award-winning wines,” said Steve. “There is a lot of history on this land and we all share a love for farming. We put our emphasis on growing high quality fruit and as we were growing up we learned from our dad to never take shortcuts.” For the Sangiacomos, farming is more than their career; it’s a lifestyle. They are proud of their legacy and want to carry it forward, giving both the legacy and lifestyle to the next generation. As a multigenerational family business, the Sangiacomos are doing everything they can to protect and preserve their land so they can pass it onto the next generation. “I love that the opportunity is there for all the children if they want it,” said Mia, “but there’s no pressure.” Mia recounted how her grandmother always told her and her brothers not to feel pressure to be a farmer. While they all would love to see their children take over the vineyards, Mia and her brothers want to convey their grandmother’s message to their children. Family is important to the Sangiacomos. In their multigenerational family business, everything is run by everyone working together. Angelo, Lorraine and Buck still have breakfast together every day before going to out to the vineyards. They let Mike, Steve, and Mia make the decisions but they often offer their advice and are proud to see the younger generation successfully running the family business. The Sangiacomos embody the spirit of a true farm family, one that plans to still be farming many generations into the future. They take pride in what they do, producing a high quality product, and they are both proud and humbled to be accepting the Farm Family of the Year Award. The Sangiacomos believe that the Farm Bureau represents them in a vital way by putting the farmer’s best interests at the forefront from both a regulatory and political standpoint. 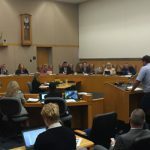 Agriculture is important to the Sangiacomos, and they believe without the Farm Bureau agriculture in Sonoma County would be at risk. 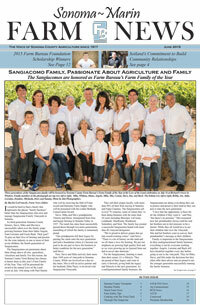 It would be hard to find a family more committed to protecting and preserving agriculture than the Sangiacomo family. They exemplify the idea of a successful multigenerational farm family and are an important asset to Sonoma County agriculture.